Using a planting guide for fruit trees can help ensure the successful growth of the tree. If your recent fruit tree purchase didn't include planting instructions, read on for a step-by-step guide for planting and caring for your new tree. Nothing says spring like wandering through a local nursery and perusing the variety of new fruit trees for sale. Depending upon your locale, there may be apple, pear, cherry or even lemon, lime and orange trees for sale. Before you plunk down your hard earned cash for these desirable trees, do a little advanced planning so that the new trees will thrive in their new home. The best time to plan fruit trees may be late fall, early winter or early spring, depending upon your location and climate. The key is to plant prior to the ground freezing, but after the long warm spells are finished (if it's too warm, the tree may sprout new growth just before winter). The tree's root system needs time to get established prior to starting new growth. Sprouting new growth requires a lot of energy and nutrients from the tree, as does establishing the root system. Summer is a bad time to plant as it is usually too hot and it will cause too much stress for a new tree. Most fruiting trees will need full sun for part, if not all, of the day. In addition, the full-grown size of the tree also plays an important part in the location of your fruit trees. Standard-sized trees may need from 15 to 20 feet to spread out, whereas a dwarf tree may only need 10 feet for the limbs to spread out around it. Soil is also important in planning where to plant the new fruit tree. If the soil is compacted with clay, it will need to be amended with other plant materials before planting the tree. If the soil is rocky or has bedrock close to the surface, choosing another less rocky location will be better for the tree. Dig the hole. The first thing that needs to be done before planting the tree is to dig a hole that is right for the tree being planted. It should be one and a half times as deep as the length of the roots and twice as wide as the spread of the roots. Once the hole has been dug, keep the dug soil off to the side of the hole. Prune the tree. Many nurseries will have already pruned the tree so it gets off to a healthy start. If it hasn't been pruned, carefully remove any dead or broken branches and prune back one third of the top from the tree. In addition, prune any twisted, broken or dead roots from the bottom of the tree. Mound the soil in the hole. Mix some compost with the soil that was set aside and create a mound of soil in the hole. Carefully place the tree on top of the mound and gently move the roots so they are spread out across the mound. The area where the tree trunk attaches to the root system should be above the ground level. Position the stake. 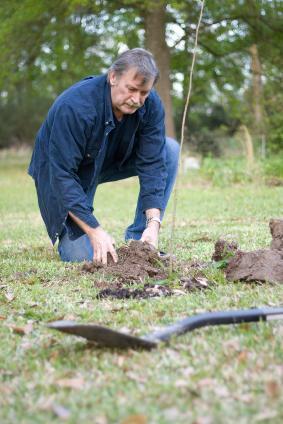 Before the soil is filled in around the plant, position the stake at least three inches away from the tree. Be careful that you do not break any of the roots in positioning the stake. Fill the hole. Fill in the soil around the roots a small amount at a time, gently patting down the soil around the roots, which eliminates air pockets. Continue filling in the hole until the ground is level again around the plant. If the tree is being planted in an area where water needs to be conserved, create a little valley around the circumference of the hole to help to retain water. Water the tree. It is important to keep a new tree well watered, but not over-watered. The ground should be moist, but not soaking wet. Tie the tree to the stake. Once the plant is situated in its new home, a tie can be attached to the stake and the tree to help it grow straight. The tie should be made of a flexible material that has some "give" to it so that it doesn't dig into the bark of the new tree. Growing fruit trees can be a fun hobby for adults and children alike. There are many fruit tree varieties available, which make it possible for people in just about any hardiness zone to successfully grow them. Following this easy planting guide for fruit trees can help to ensure healthy trees that will be enjoyed for generations to come.